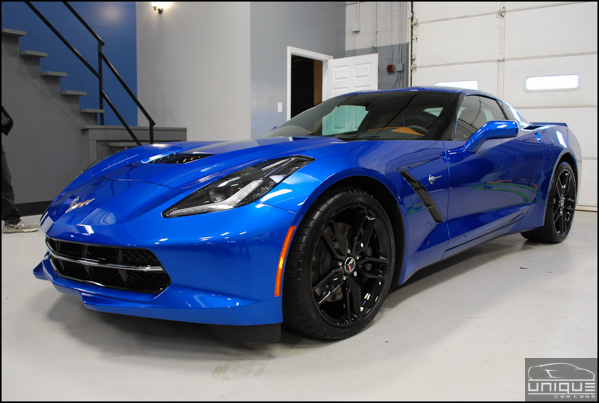 Interior detail, exterior detail with paint correction, install Xpel clear bra paint protection film (clear bra) to partial hood, partial fenders, complete front bumper & headlights. 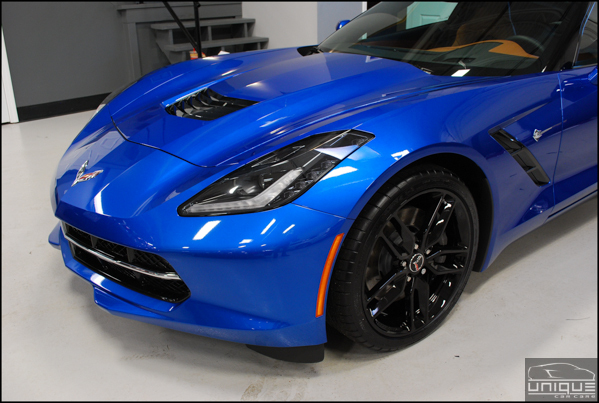 Apply Opti-coat Pro ceramic coating to complete exterior, including all paint surfaces, clear bra surfaces and wheels for maximum protection & durability. 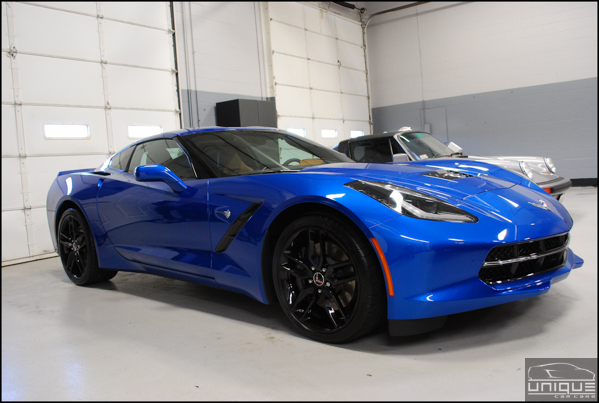 The owner of this beautiful C7 Corvette Stingray wanted to ensure that the paintwork was protected against stone chips, road debris and every day wear and tear since he had just purchased the car off the showroom floor. 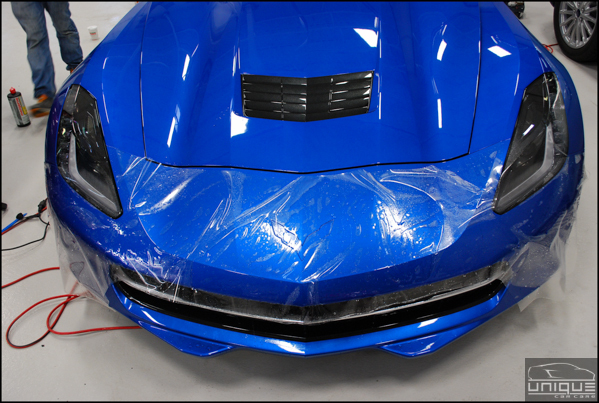 With our “Standard Wrap”, the paint will be protected and continue to look new for years to come. The owner told the dealership not to prep the car, so it was brought to us untouched. 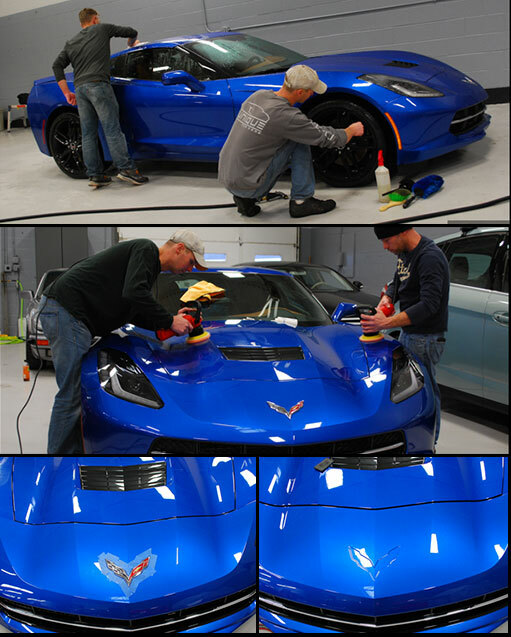 Before the clear bra install, our goal was to get the paint looking as perfect as possible since even brand new cars typically have minor imperfections. The exterior received a hand wash and claybar treatment to remove any possible bonded contaminants prior to buffing/polishing. 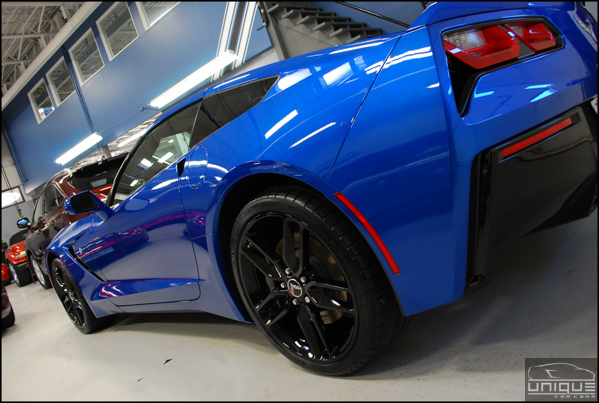 All exterior paint surfaces were polished to ensure the paint was absolutely perfect and defect-free. 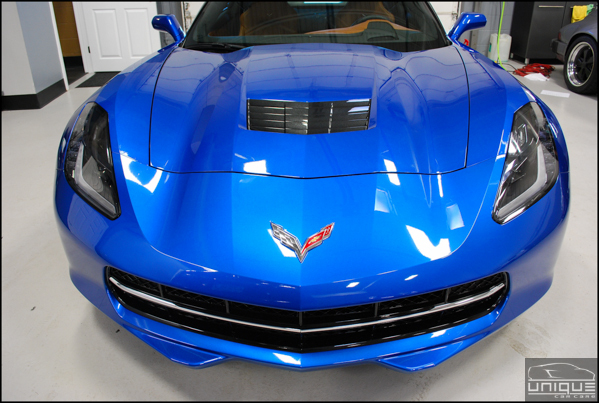 After polishing, the C7 emblem on the front bumper was removed. Removing it allows us to apply the film underneath the badge to avoid any unnecessary seams. Xpel Ultimate film was chosen for this install, which has great clarity, no orange peel and has a clearcoat topcoat. The best thing about the film is that is has self-healing properties if you happen to scratch it at some point. Any type of heat (sunlight, engine heat, hot water, etc. will promote the self healing and the scratches will disappear. It also has great UV protection and will not discolor, fade or get cloudy like other films on the market. Most films look great when first installed, but typically degrade not even a year later. This film is backed with a 10 year warranty. 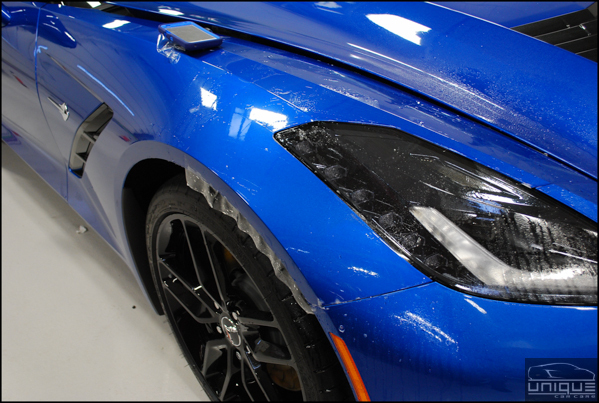 The customer opted for a fully custom install versus a precut, allowing us to make all seams very close to any openings (reflectors, headlights, foglights, etc.) for a much cleaner install with added coverage. In addition, all edges are completely wrapped over (hood, fenders, etc.). 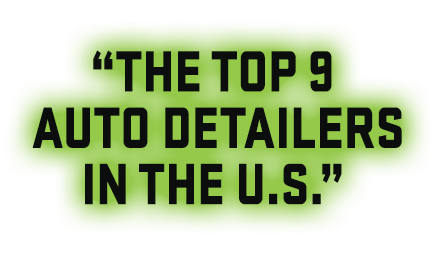 After the install was complete, the car was wiped down with Panel Wipe, which removes anything that might interfere with the bonding of the Opti-coat Pro ceramic coating. 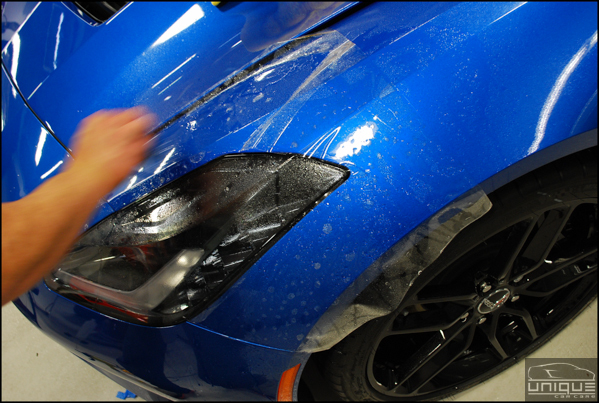 For those not familiar, Opti-coat Pro is a permanent ceramic clear coat that provides superior resistance to scratching and chemical etching from environmental impacts. 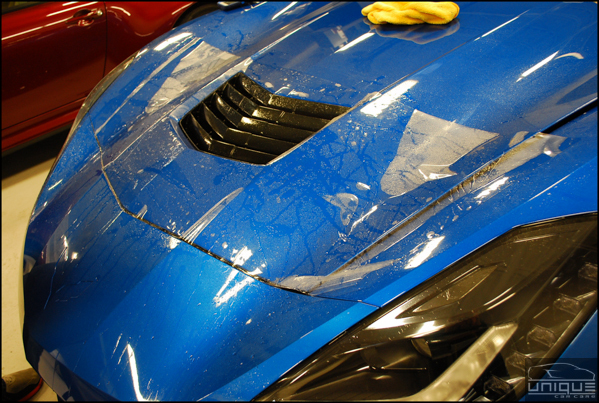 It provides permanent protection for all factory paints, and can also be applied to clear bra, metal and hard plastic surfaces. 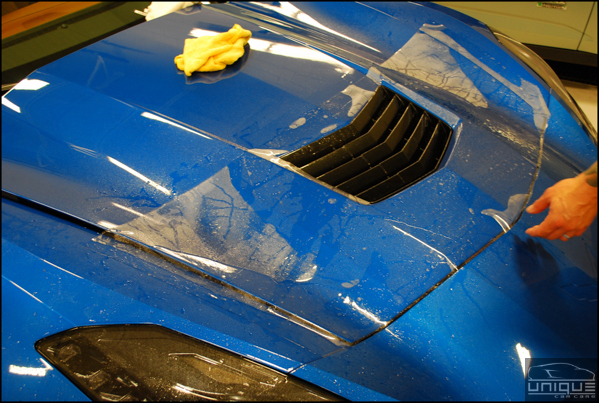 Unlike typical waxes and sealants that degrade over time and are easily removed through washing with water or chemicals, Opti-Coat Pro does not degrade and cannot be removed by chemicals such as caustic degreasers. 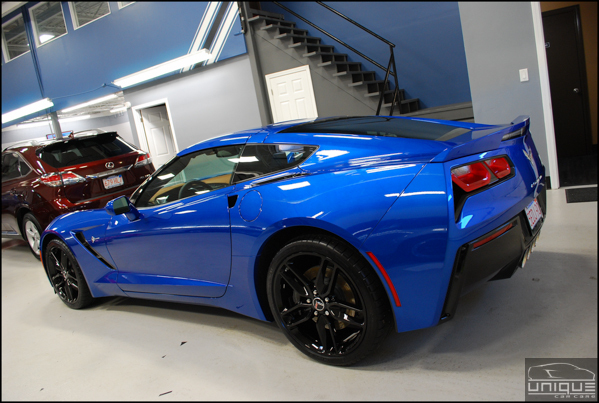 Here are the final results after the Opti-coat Pro ceramic coating application! 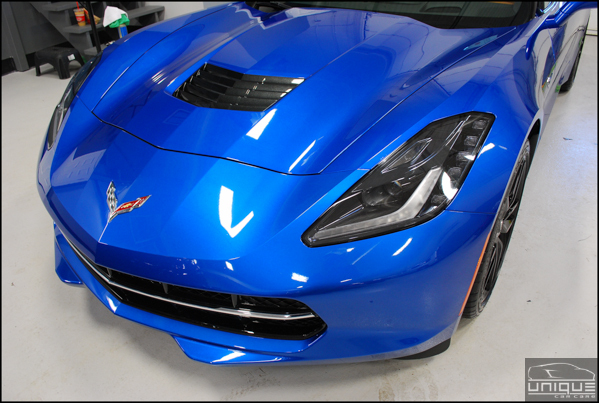 If you have any questions regarding the clear bra or ceramic coating,, we’d be happy to tell you more about the film, go over coverage options and discuss pricing. 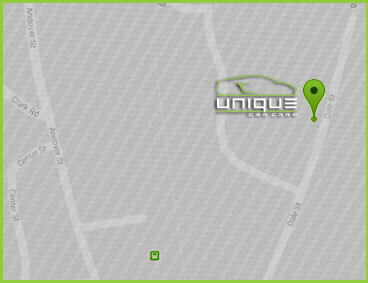 Please don’t hesitate to contact us. We are available by phone or email to help any way we can.